This post initiates me into the blogosphere universe and I find that I am both excited and apprehensive. Like that of any new journey, the excitement comes from a seat of knowing that there has been much preparation and direction to get to this point and the time has now come to cross the threshold (into the blogging world, that is). The tension to the thrill is held by trepidation; I mean, what if these words, thoughts and stories mean nothing to all of you who inhabit these virtual landscapes? This nagging fear of the unknown, quite honestly, slows my poised fingers as they hover over the keyboard. There is great risk when one travels with transparency and journeys out from places of comfort. But, I have a strong sense of solace knowing that without these steps away from what is known and familiar, that which is HOME to me will never expand and challenge me to continue to become all who I am intended to be. And that is really quite it; that is what I have been thinking about, reading about and talking about for years: in what ways are we intentionally living (for the sake of metaphor, insert ‘journeying’) out our lives so that when the pilgrimage cycles commence and begin again, we are engaging in this dynamic cycle of calling, departure, arrival, to—ultimately—Home again. It is this sense of Home that is compelling to me. Of course we have our structural residences, but I’m talking about the conceptual framework of this internal habitat. What is it that is so familiar and comfortable that it is like home to us? What does it look like? Who are the neighbors? Who lives and visits within the walls? What meals are shared? Who do we encounter on our Journey that is brought into the hearth of our Home and how does this simple act of hospitality create a culture of common good? 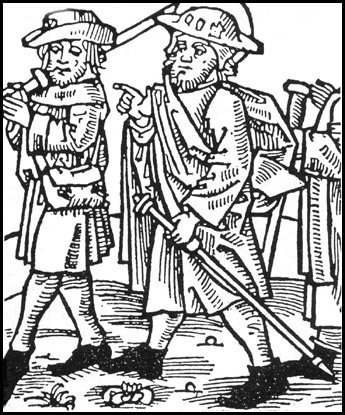 One of the ancient principals of pilgrimage was that the pilgrim was journeying on behalf of something. Whether that was a prayer, a petition, in penitence or even traveling in place of someone who couldn’t make the trek themselves, there was an elemental understanding that the journey was taking place on account of something, or someone, far greater. This positioned the pilgrim to travel in such a way that employed a keen eye and an astute ear; no longer were there such things as trivial events and random people. The value of fellow pilgrims and strangers alike was considered great, so much so that every encounter was acknowledged as a source of wisdom and possible enlightenment. The significance of ‘the Other’ was recognized as a sacred way marker and seen as a critical component to a journey well made. So here it is, and this is the hopeful intention of Waymarkers: the blog. Our lives are a pilgrimage. Each of us has been called to journey thoughtfully and intentionally through our days. We are asked to see the sacred all around us, but specifically in those other than ourselves. What exactly does this mean? It really is as simple as it sounds: anyone OTHER than you. This includes those that don’t look like you, act like you, live like you, or think like you. We are called to see them, travel with them, and yes, even live on BEHALF of them. This process of linking Other to our self begins the transformational unfolding of Other becoming Neighbor, and ultimately, in practicing the universal command of “Love your neighbor as yourself”, becoming your self. For when this conversion occurs, we suddenly cannot look away from the injustices and pain experienced by those other than ourselves, for it is now happening to US. We now journey forward on behalf of a common good for ALL. And how does the Future fit into all this? The Future isn’t now and it certainly isn’t what was, so why concern our self with it at all? Well, in a very real sense, the Future is Other to us. Our modern Western culture certainly has made great strides in our era, but a monumental failure was its inability to assimilate indigenous people’s capacity to see forward and understand their behaviors had long-term implications. This ‘seven-generation sustainability’ concept has its origins with the Iroquois people. This ‘Great Law of the Iroquois’ maintained one should think seven generations ahead (a couple hundred years into the future) and decide whether the decisions and actions they made would benefit their children, and children’s children, seven generations into the future. This is a call and a challenge that we need to heed today; this view transmutes the Future, and our ecological concerns, into today and makes it a ready companion to our every action. It becomes our neighbor. It becomes our self. It becomes our HOME. There it is folks. These are the foundational themes to this blog. Am I excited about thinking aloud with you all around these topics? Absolutely! Am I scared that I may not get it right and my own personal stories of living on behalf of Other and the Future might not be your version of virtue? Yes. There is that tension mentioned earlier again…but my hope supersedes this. I pray that by inviting you into my HOME you too will help hone me. That by saddling up together on this journey of life, we will see one another and our stories as sacred. That by living forward in ways that see the Future as important as today, we will all seek out that which is the common good for us all. And we will get lost; one most certainly does on a trek that carries with it much treasure. In these times of uncertainty, in these straying seasons, may we return to our God-given travel mates—Other and the Future—and ask them for guidance. May they be our way markers that point us all towards HOME. This morning I awoke to bird-song outside my bedroom window; a robin was perched in a wintered tree and was robustly singing alongside the rising sun. This melody was a delightful reminder that Epiphany is upon us; the season where we proclaim that God is indeed with us is NOW. Throughout the dark-filled Advent season we prepared our homes, our trees and the containments of boxes for Christmas. We prepared for a day to come, a day which marks the arrival of the Christ Child. We moved forward with anticipation and delight, counting down the days and hours to this sacred time. And with Epiphany now here, we are invited to join with the age-old Wise Men and celebrate the reality of the Christ Child, to proclaim the promise of a prophecy, to commemorate the covenant of what comes out of Christmas being planted in our hearts. Due to the fact that Christmas fell on a Sunday this year, we spent a shorter time leisurely around the tree, and prepared to gather with our faith community at Madrona Grace Church. Once there, the children (don’t all good lessons come by way of the children?) were engaged with the Nativity Story from Mary’s perspective and the great gift she was given of carrying the life of Jesus. The lesson was further emphasized by the simple assignment of placing a pole bean seed within the wetted, soft folds of a paper napkin inside a clear jar. “The seed, the promise of Jesus, was planted in Mary,” the activity affirmed. “What has God planted in you? 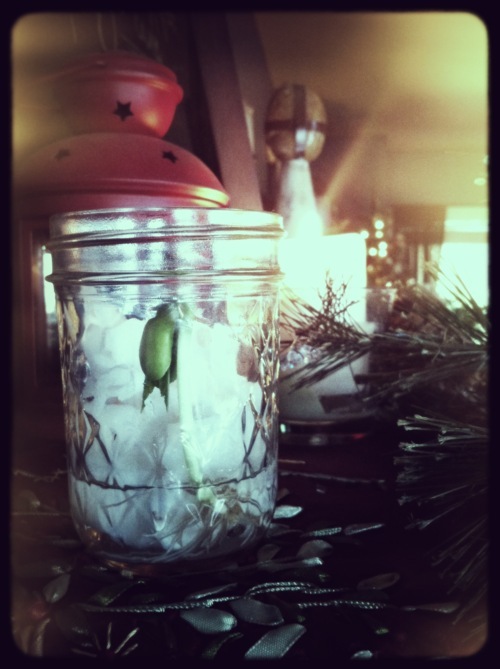 What great gifts are growing in you?” The instructions were for the children to bring the jar home and place it on a windowsill. Daily they are to water it, watch it and wonder about what that is that has been planted in them. Today, following the 12 Days of Christmas, the small seed has swelled with new life. It has sprouted a sustainable root system and grown a full two inches. Leaf fronds are emerging from the bean pod and the boys’ wonderment is real (and oh so good!) as they have witnessed the growing life from within this little seed. They are so eager to plant this pole bean in the earth and eat the tasty fruit from its vines. For this we must wait a bit longer, but the simple lesson from Christmas morning is very clear on this day of Epiphany. We do prepare for Christmas, and prepare well we should. We are creating the conditions for the coming of the Christ Child into our lives. We are opening ourselves up to the life-giving promises of this contrary, cosmic Story. Even so, the Christmas Tree has likely grown dry and it is now the time for the festive accoutrements to be put away. But as we pack up the ornaments, and replace the holiday enhancements with the normal household arrangements, we should not be packing up the truth of the season as well. God came on Christmas Day, but God didn’t leave. Jesus, Emmanuel, God with us, is still here! The seed that was planted within Mary grew and became the SAVIOR. So on this day, which marks a new season of celebrating the presence of God, I am struck by the roots of this quickly growing pole bean. I am stilled by this visual of quick and ready growth, when the conditions have been prepared just so. I hope that the gifts that I have been given, the blessings planted within me, are growing at a rate that will allow me to make gifts of them to others. I hope that I too can join with the Three Kings and give what I have been accorded.